Wallace Chipidza has been busy. The Information Systems PhD candidate has co-authored two published papers, taught at Northrise University in Zambia, and will present his own paper at the International Conference on Information Systems (ICIS) this month. (He has another co-authored paper under review.) Not to mention, Chipidza, who is in his third year of the doctoral program, attends class and works as a graduate assistant. "I am an academic," Chipidza said. "When I worked after graduating from college, I found that I really missed the classroom experience. It's one of my favorite places to be—in the class, exchanging ideas." His co-authored articles with Professors Gina Green and Cindy Riemenschneider focus on understanding the factors that affect student enrollment in management information systems (MIS) classes. Despite loving the classroom environment and having co-authored three papers on the subject, Chipidza's main interest isn't in information systems education research and increasing student enrollment. 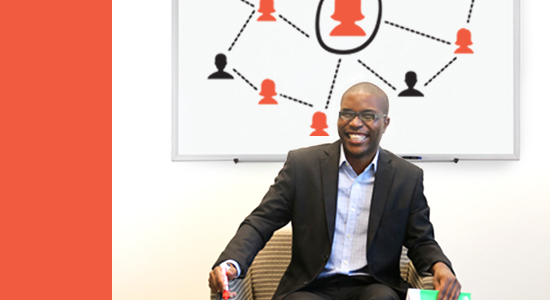 His own research focuses on the value of networks. The interconnectedness of people and ideas fascinate the former Computer Science student, and he plans to focus his research career on the study of networks. "Networks are a fairly recent manner of trying to explain phenomenon," he said. "Essentially, what they do is recognize relationships are not in a vacuum. It takes a network approach to understand collaboration in the information systems research field." His single-authored conference paper, "Who is Our Paul Erdös? An Analysis of the Information Systems Collaboration Network," attempts to find the so-called "center" of the information systems (IS) field. For the paper, Chipidza mapped out the relationship network of journal co-authors. He did so through the collection of 40 years of data from eight leading IS journals. "I was trying to determine whether the characteristics of the researchers determined their propensity to co-author with someone else," Chipidza said. "My claim is that by looking at those networks, we can understand a lot more of the organization of authorship or about international trade just by looking at networks." Although he would like to examine a larger data set, his initial findings, which he'll present at ICIS, do have important implications for the industry. "The findings are that there is a propensity to co-author with people of the same gender, more than would be expected from chance, and there's also a tendency to collaborate with people that are in the same geographical region," Chipidza said. "It makes sense on one hand. On the other hand, you sort of expect academics to choose co-authors based on complementary competencies. That homophily—that tendency to collaborate with people who have the same characteristics as you—you wouldn't expect that to be prevalent amongst academics. It's a little surprising." This finding sheds light on an opportunity for researchers to diversify their thinking. "The field might not be benefitting from a diversity of ideas," he said. "That's important because if you have teams that share the same characteristics according to gender or geography, you're not getting a cross-pollination of ideas. With more gender diversity or geographical diversity, you get higher quality ideas germinating and actually enriching the field." Fewer than 1 percent of those in the IS field who published in the journals Chipidza examined graduated in Africa. As a native of Zimbabwe, the lack of Southern Africa's representation was saddening. "That gap between the developed and the developing worlds is not going to narrow because of this resource difference," he said. "It's a problem for me. It's a problem for African researchers." Eventually, Chipidza plans to teach in his native country, although, he doesn't know if it'll be full-time or during the summers. He just wants to give back.